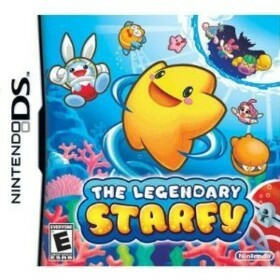 The Legendary Starfy is a Nintendo DS game in the Platformer genre. The game was published by Nintendo and developed by Tose. The game has an ESRB Rating of E (Everyone 6+) and was released on 2009-06-08. The game's official site can be found at www.starfy.com/?cid=eml09DSNL05010. An innovative fun platformer/action/adventure game with some very nice graphics and sound. This is quite a fun title starring a Japanese game series icon Starfy. This really is a cutesy looking game which children and adults who just want to have some without the game being to challenging will enjoy. The game revolves around the hero Starfy joining forces with his best friend Moe the clam to help out a space traveller named Bunston who crashed thru their roof while fleeing some evil space villains. Bunston is a “bunny like” creature who unfortunately has lost his memory due to the fall. Starfy and Moe chase after him to return a crystal fragment that they found when he crashed. The story basically involves Starfy, Moe and Bunston travelling from world to world fighting nefarious bosses in order to regain all the crystal fragments. The games cutesy charm and fantastic graphics and sound go along perfectly with the fun action/adventure story. I really enjoyed swimming and spinning at the elements as Starfy. The bright colours and catchy music really added to my experience. The game chooses not to take a “Mario” like approach to platforming but rather a more exploration approach. The bosses were not too difficult and the game in general is a bit on the forgiving or easy side. This game would really be great for kids or novice gamers who are just starting to play games. I never found the game to be irritating or drawn out and even though the game is also somewhat on the short side it is still a fantastic experience. The developers TOSE chose to add a nice shop feature and unlockables as well as many hidden areas to really help extend the game out beyond the somewhat short amount of time it takes to clear the story. Multiplayer and mini games are also included and I especially found the co-op mode with Starfys sister Starly to be really fun and helpful when facing some bosses.